In-Play or Live Betting is becoming increasingly popular, with major bookmakers running a range of markets in play on main games. In play markets allow bets to be placed as the game is in progress, using information from the game to predict what is going to happen next. For example if there is plenty of attacking play from one team you may wish to back them to win. 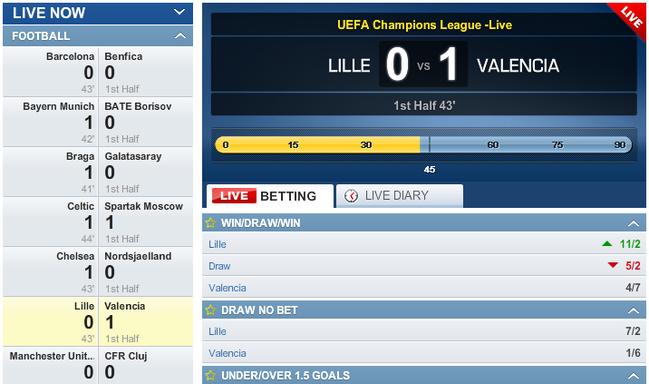 As the time remaining decreases single events can become very significant adding to the excitement of in play betting. Late in a game the prices can become quite long as there is less time remaining, which can add the attraction of in play betting. Our guide introduces in play betting, giving you everything you need to know to bet in play. We then discuss key markets for football in detail. Through the guide we interchange between, and quote both fractional and decimal odds. The prices offered on different markets will fluctuate and move as the game progresses and things happen. As a bet is placed the price at that point is secured and taken. 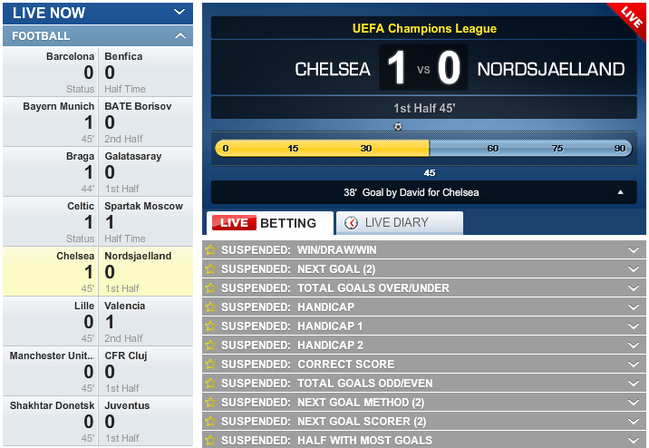 Image 1 shows an in play page for a Champions League Match between Chelsea and Nordsjaelland. When a potentially important moment in the game occurs bookmakers will suspend all markets. This may include a goal being scored, a penalty being awarded, or a incident happening that may lead to a red card. During this short period no prices are offered and it is not possible to bet. Once the outcome has occurred (e.g. goal scored or missed, penalty being taken, referees decision made) the prices are re-offered. These may be the same, or the market may have moved to reflect the new state of play. Image 2 shows the market suspending between Chelsea and Nordsjaelland, this happened when Chelsea scored a second goal in the game. Be aware that an in-running delay of between 5 and 10 seconds will occur when a bet is placed. This is to ensure betting is fair, and that no one is able to gain an unfair advantage by betting on an outcome as it is occurring. This is shown in image 3. It is possible to bet in play alongside bets that have been made before the game starts. This would allow you to either protect profit if the game was going well from the point of view of your initial bets, or to cut loses if things are not going well. If your selection was at shorter odds in play than the price taken pre match then it will be possible to take the opposing stance to guarantee a profit. This may involve betting on several outcomes to cover all angles (such as betting on a draw, and the opposition). If your selection was at longer odds in play than the price taken pre match then it would still be possible to take the opposing stance to protect some of your money. This would avoid a total loss of stake if the bet loses. It should be noted that if placing bets pre match, and then opposing those in play that you would pay the bookmaker cut twice. This is because when pricing each selection the bookmaker takes a cut. This is illustrated by the fact if you were to bet on all sides of a bet at the same time, your return would be less than your total stakes. In the remainder of the guide we give examples of bets placed pre match, and in play. We also consider how betting in play can complement pre match bets.